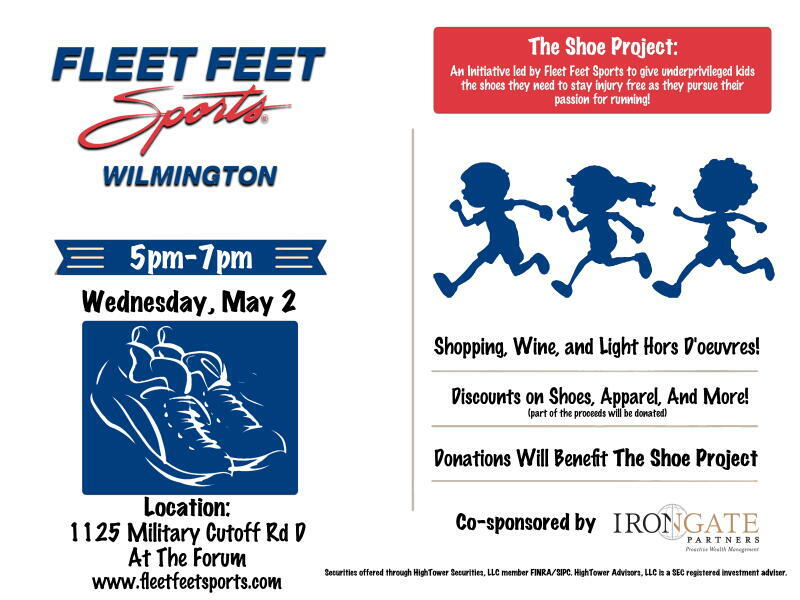 Join us on Wednesday, May 2nd from 5:00 - 7:00pm for an evening to raise money for "The Shoe Project", a new initiative led by us, Fleet Feet Wilmington, working to provide underprivileged youth in the Cape Fear region the shoes and gear they need to stay injury free as they pursue their passion for running. We will have light hors d'oeuvres, refreshments, and deals and discounts on select products. Donations will be accepted and 10% of sales will be donated to "The Shoe Project". So come, shop, mingle and help support our youth in the community. To RSVP please email wilmington@fleetfeet.com.